If you are a loyal fan of the Ghibli animation studio, I am sure you will know the legendary movie Mononoke Princess. Produced in 1997, the film has written a tearful indictment of the devastated forests devoted to human development and the prediction of nature vengeance. Ashitaka – a prince, a hero, a cursed man. A person is pushed out of his or her own community and single-handedly seek a remedy. Details he cut his hair and give up his position in the tribe has made his heart ache. Why he makes that difficult decision? Because of his self-esteem? Or because of the people he risked protecting? We will never forget the monster who brought the curse to Ashitaka. A wild boar is shot by an iron bullet – the wound burns it from within and turns it into the devil. Is it the fate that it is chosen? Who is responsible for that fiery hatred? Ashitaka was built as a typical Ghibli male lead – talented, courageous and tolerant. Remember the battle in Iron Town, when Ashitaka was struck by a bullet hit, he was able to stop the battles between 2 woman, even having the strength to open the gates of liberation the life of San. It is the action of a true hero. This is a detail that can make any woman touched. Despite a severe injury to his abdomen and a knife close to his neck, Ashitaka can still say, “You’re beautiful”. It was an arrow that helped him rip off the wolf’s part and touch the part of San. A miracle. The beginning of a love affair. This scene is shown along with the theme song of the movie. With a deep and melancholy tone, we wonder if it was San’s voice when he first looked after a human boy in a human way. There is a deep tear in the heart of the wolf girl, a question about the ego when she is touching her fellow beings. 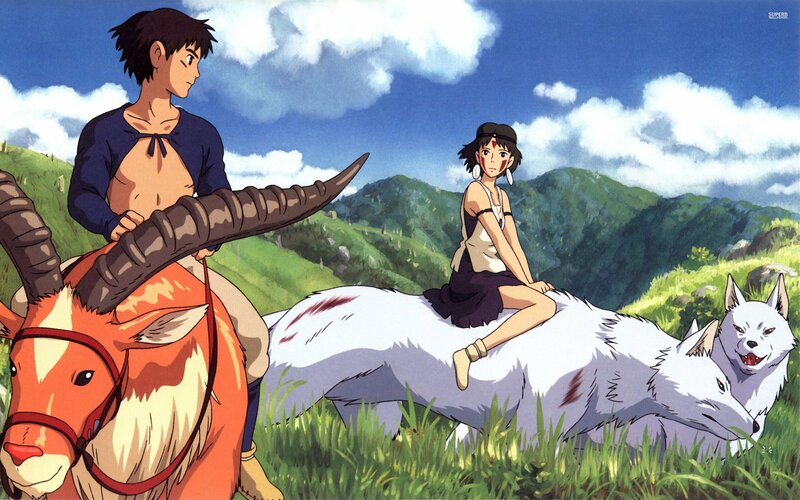 If you are a fan of IC then you can buy related products Princess Mononoke Merchandise . Humanities appearing in the film mostly belong to the villains, but few see the humanistic details that can only appear in human society. Iron Town became a threat to both nature and the Emperor because they had mighty guns – a mighty weapon made by the hands of the leper. Eboshi – the owner of Iron Town – rescues them with the love of a great mother, helping the women in difficult plight. The Emperor’s promise made Eboshi dare to take the head of the forest god and the whole town of Iron suffered a terrible disaster. Tornadoes, swift currents, screams represent death. Humans need nature, but nature doesn’t need humans. If we take nature, there will be a natural return and we will pay off all our debt in the past with our own lives. As Ashitaka and San raised the head of the god, the hateful curse came down on their heads and shone brightly. Is this a late apology? Yes. The forest spirit will never return to humans again. Is redemption necessary? Yes. San and Ashitaka – two small people – have accomplished that great mission, and are saved. Everyone is surprised when Ashitaka refuses San’s invitation at the last minute. Why is a man who is considered dead like Ashitaka still accepts the life of the wanderer? And how do we understand San’s calm attitude? That’s because their path is different. Their world is different. Their love is true, but each person’s future can not be entirely devoted to feelings. They are all great, and they will make life even bigger with their hands, like a large bud growing into a large tree full of shade.